There was a lot of fierce debate about whether we should open the massive and ancient black sarcophagus that was unearthed in Alexandria, Egypt, a few weeks back. For many, including this reporter, the damn thing needed to remain closed, lest we all be subjected to some kind of horrifying, world-ending torment. Nobody listened to reason, however, and yesterday, the sarcophagus was opened. What was revealed was not buried treasure or some massive curse (yet) but three average skeletons, possibly soldiers, baking in a lot of red liquid. And because the internet is the home for forbidden snackers of all types, some people wanted to drink that sweet, sweet mummy broth. 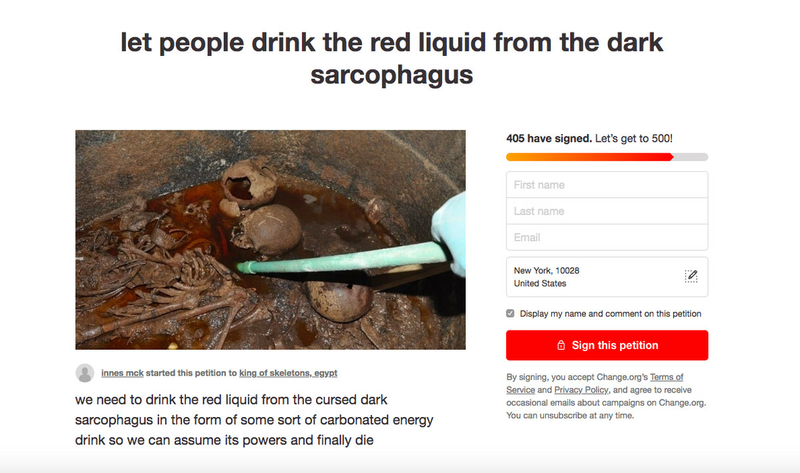 This article originally appeared at: https://www.theverge.com/2018/7/20/17595198/black-sarcophagus-bone-juice-campaign.